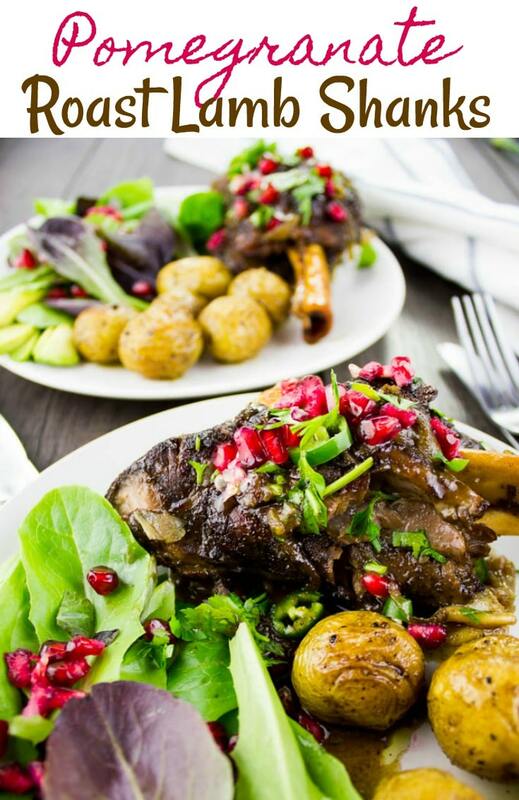 These fall-off-the-bone tender, slow roasted lamb shanks are flavored with sweet homemade pomegranate molasses, nutmeg, and cinnamon making this dish the perfect main for your holiday table! 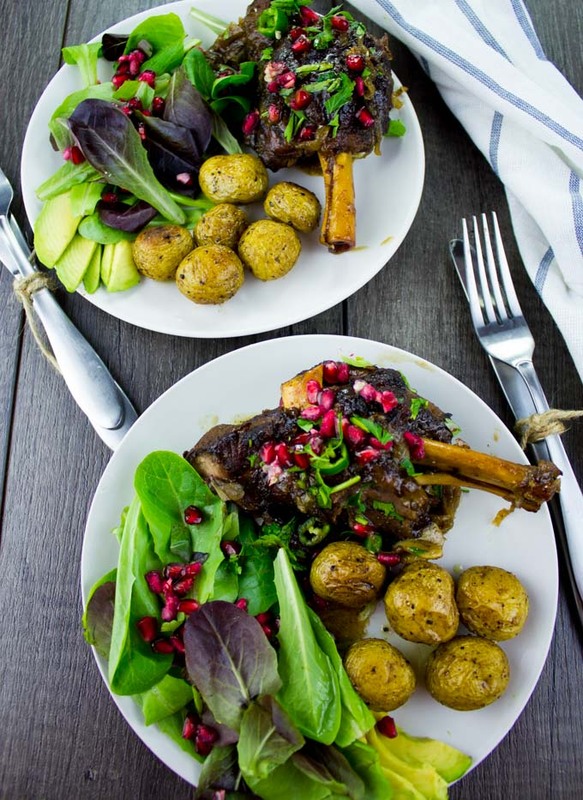 Roasted over a bed of garlic and onions, these Pomegranate Roast Lamb Shanks are a burst of flavor and the perfect festive main for the Holidays! Serve alongside any veggie side dish, rice, pasta, bread or potatoes! Today’s roast lamb shanks are my favorite for the Holidays!! Not a surprise, I know. Lamb is perfect for the Holidays because it’s packed with flavor, so versatile with plenty of different cuts, and it feels so festive! To me, roasted lamb is absolute comfort food, which is what I look for every holiday. Above all, when it comes to lamb, I can’t stress this enough—make sure you’re buying American Lamb. There’s absolutely no comparison between American Lamb and any other. Take that from me, I’ve lived in many places and ate lamb almost all my life. I can tell you for a fact that American Lamb beats them all. If you guys ever visited a farm, you’ll feel so connected to the place and the people behind it. Supporting local farmers is almost like an instinct we should all have. And when it comes to lamb, not only you’ll be supporting hard working devoted farmers, you’ll also be getting the BEST lamb there is! American lamb is raised to the highest quality standards, it’s as fresh from the farm as can be, and above all, it tastes AMAZING! Now for these roasted lamb shanks, you can scroll below for a short video on how easy they are. No marinades or fuss, just toss the shanks with salt, pepper, nutmeg, and cinnamon. Then a drizzle of pomegranate molasses, olive oil and that’s it! Toss the lamb shanks with tall the amazing flavors, then place them on a bed of sliced onion and smashed garlic. Finally pour in some stock and roast these shanks for nearly two hours. 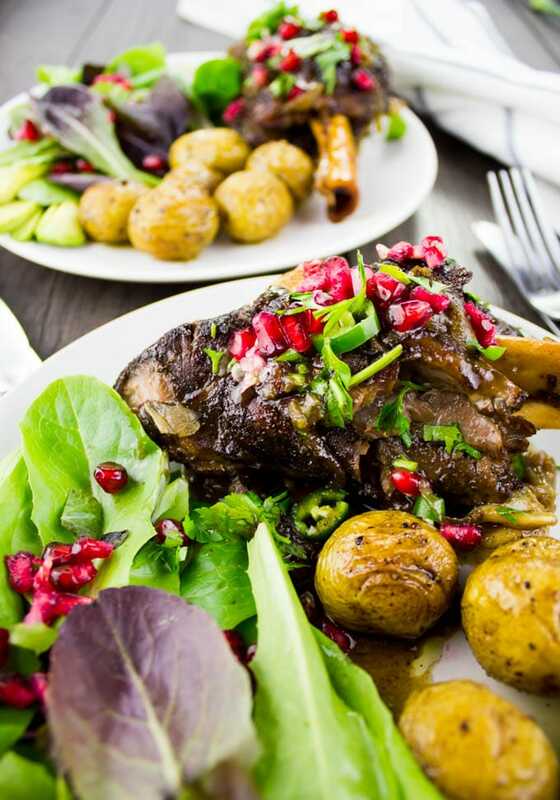 Pomegranate roasted lamb shanks is really one of those meals you can whip up the day of, or even a few days before and warm it in the oven before serving. You don’t need any fancy cooking skills, just some spice and go! Another thing I wanted to mention is the pomegranate molasses. You’ll find it at the ethnic aisle of most grocery stores now, and if you want to make some from scratch ( I strongly suggest you do! ), I’ve included the recipe below. This magic sweet sauce is great for cocktails, salad dressings, sandwiches, lamb, chicken, desserts, you name it! Use it the same way you would use a nice thick Balsamic reduction. If possible, make sure to buy American lamb, which has the best flavor. Pomegranate Molasses is available in the ethnic aisle of most grocery stores. It’s made out of pure Pomegranate juice, some sugar and lemon juice. These ingredients are boiled and reduced to a consistency of a syrup. I included my favorite recipe for homemade pomegranate molasses. By placing the lamb shanks on a bed of vegetables, the meat won’t stick to the bottom of the dish. At the same time, the meat will get infused with the flavor of garlic and onions. 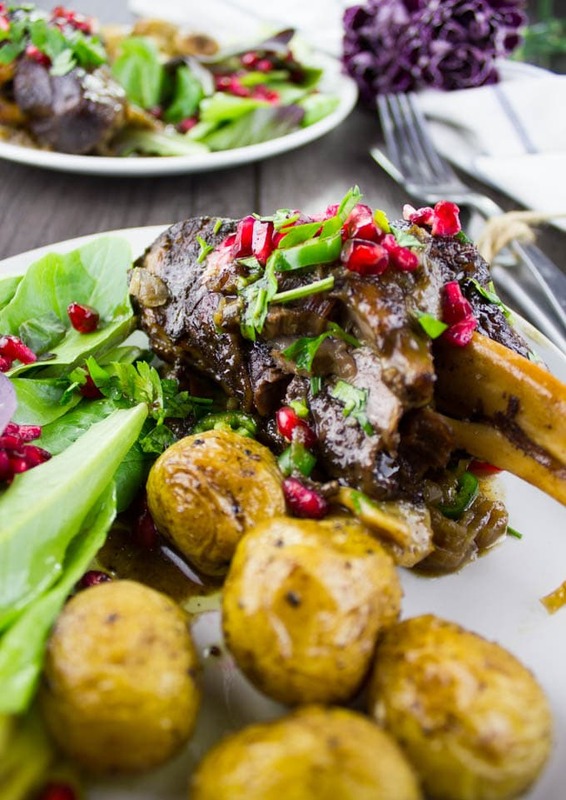 These fall-off-the-bone tender, slow roasted lamb shanks are flavored with sweet homemade pomegranate molasses, nutmeg, and cinnamon. The perfect main for your holiday table! Preheat the oven to 400 degrees. 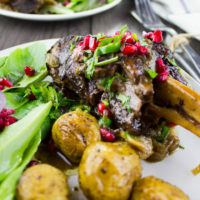 In a large 3-quart oven safe dish, place the lamb shanks and season them with the pomegranate molasses, salt, pepper, nutmeg, cinnamon and drizzle the olive oil. Use tongs (or your hands) to toss the lamb shanks very well with all the seasonings. Add the sliced onions and crushed garlic cloves to the baking dish and tons them with the lamb shanks—keeping most of the onions and garlic at the bottom of the dish so they act like a bed for the lamb shanks. Add in the cinnamon stick and pour the stock over the lamb mixture. Roast the shanks for one hour, and then cover the pan with foil (add extra stock if you’d like a saucy lamb shank). Roast (covered) for another 45 minutes- 1hour until the shanks are tender. Remove the pan from the oven, sprinkle some pomegranate arils over the lamb shanks, sprinkle parsley and chili peppers too! Serve and enjoy! Place all the ingredients in a medium-size pot over medium-high flame and bring to a boil. Reduce the heat to low and allow the mixture to simmer for about 50-60 minutes until it has a syrup consistency and has reduced to about 1 cup in total. Cool the molasses for about half an hour before storing it in an airtight container in the fridge for about 6 months. Use it on lamb, chicken, salads, drinks, sauces and for baking! By placing the lamb shanks on a bed of vegetables, the meat won't stick to the bottom of the dish. At the same time, the meat will get infused with the flavor of garlic and onions. ©TWO PURPLE FIGS all images and content are copyright protected. Please contact me if you would like to use any images . If you want to republish any of my recipes, please link back to my website and the recipe post.